Does your dog seem nervous and uneasy every time you go out the door? Often, this behavior is a symptom of an anxiety disorder. Separation anxiety is a common condition in dogs and as the name suggests, it happens when your dog or puppy finally gets to stay home alone. Using a crate is one of the first things you should try in order to stop or prevent separation anxiety in puppies and adult dogs. It is also by far the easiest way to deal with the situation. Our Pick? Petmate Sky Kennel. Click here to check it out on Amazon. Keep in mind that the crate acts as a shelter, serving as your dog’s designated safe place. Over time, simply the act of entering the kennel will bring your dog a sense of security, whether you are home or not. In this review, I will share my best dog crate for separation anxiety, and also talk a little bit about anxiety signs in dogs, as well as other benefits related to kennels. Anxious Behavior: Pacing and panting are a strong indication of separation anxiety. Oftentimes, your poor pooch will walk back and forth throughout the house and follow your every step while you are getting ready to leave. Destructive Behavior: Chewing and scratching means that your dog is so anxious while you are gone that they are trying to self-soothe. Excessive Vocalization: If your dog tends to whine, bark or howl after you leave, you may be dealing with separation anxiety. Keep in mind that some dog breeds are more vocal than others, so look at other symptoms before you jump to conclusions. House Soiling: An anxious dog may also experience loss of control of his needs and have accidents around the house while you are gone. Which Dog Crates Are Suitable for Separation Anxiety? Plastic: These crates are made of hard material and tend to be covered well, which makes the dog feel protected. Also, most of these kennels are relatively easy to carry, especially the ones that come with a handle. Wood: These crates look great indoors and can even serve as a table. They should provide enough privacy, but the kennels are usually heavy and far from portable. Be aware that some dogs may chew or scratch at the wood surface. Wired: These crates are typically strong and sturdy. However, you will need to use a cover to make sure the dog is feeling safe. Some of these kennels even fold flat, which is ideal for easy storage and traveling. Aluminum/Steel: These crates can sometimes be used to confine big, high-anxiety dogs (or escape artists) in order to prevent them from destroying or escaping their crates, which may hurt them in the process. Some dogs who deal with separation anxiety tend to bite on things to help them relax. So, when you are choosing a crate, check to see if it is made of high-quality materials that can stand up to your dog. If your dog does not have a tendency to chew stuff when he is alone, a wooden crate may be a wonderful addition to your house. But generally speaking, wood is not considered a safe choice for chewers. Since we are dealing with a pet and specifically a troubled one, we need to be prepared for potty accidents. Therefore, you want to choose a crate that is easy to clean. Some crates are completely washable or come with a waterproof floor, while others include a removable bottom tray. I would also recommend keeping an enzyme cleaner for dog urine around, just in case. Finally, you should choose a crate that is appropriate for your dog’s size. A tiny crate would be uncomfortable to lay in, while a big crate will not provide the security your dog needs and he might even try to use it as a toilet. To find the right crate for your dog, you need to know his size. Start by measuring him from the top of his head to the floor and from the tip of his nose to his tail. The height of the crate should be about 3″ taller and longer than your dog, so there is enough room for him to stand up, lie down and turn around. However, if you have a puppy and you want to use the same crate when he reaches his full size, you will need to do some research. Check online or ask your vet what your puppy’s measurements will be in his adulthood and pick a kennel accordingly. If you are unsure, choose a crate for his current size and invest in a bigger one later. Alternatively, opt for a kennel that comes with a divider and adjust the size as your dog grows. Keep in mind – for best results, the size and the strength of the kennel should match your dog’s weight. The AmazonBasics kennel is a great choice when you are on a budget. It has a plastic roof that provides a dark environment for your dog, which helps to make him feel safe and secure. Unlike many kennels, in addition to the front door, this crate has both a front door and a top door that can be opened either from the left or right and allows for simple entry and less stressful experience for your dog. The manufacturer even made the carrying aspect easier by providing a handle on the top of the kennel for easy, one-handed transport. Besides snapping the four latches, you also have the option of securing the top and bottom of the kennel using screws (included). just in case you decide to take your dog on a trip, or to the veterinarian. This product is available in 19″ and 23″ sizes, which are suitable for small dogs that weigh up to 20 pounds. The Crown Pet Products wood crate can be used as a safe place for your dog, as well as doubling as a small table for you! It is stylish and looks far more handsome when compared with the standard competition. The rubberwood build makes this kennel a cozy and private place for your dog, while the multiple openings provide good air circulation along with a great view of what is happening around him. Anxious dogs will also appreciate the sealed bottom since that allows them to hide when they need a break. Plus, the floor is covered with waterproof melamine that is very easy to clean in case your dog had an accident. Keep in mind though that this crate can only be used inside the house and it is also pretty heavy. Also, If your dog is a chewer, I would not recommend going with this one. This product is available in two sizes, 24″ for most small and medium sized pets and 27″ for most medium and large sized pets. You can also choose between Espresso or Mahogany color. The Impact crate is an outstanding option for providing a safe spot for your dog while traveling or at home. It is made from durable yet lightweight aluminum and covered on the top and bottom, while allowing ample air flow and space to see out on the sides. The material is even resistant to damage, which keeps your dog safe in case of an accidental sudden impact. This crate comes equipped with a slam latch, which means your dog is safely secured until you reach your destination. It also quickly breaks down to allow for quick storage and transport. Plus, there are handles to make things even easier. This product comes in four different sizes, which are generally suited for medium to very large dog breeds. The extra room in each crate makes even the tallest dogs feel comfortable. The folding MidWest iCrate is ideal for people with a storage problem and it still has the potential to provide your dog with the feeling of a safe den. You will, however, have to use a cover, like this compatible one from MidWest, to provide your dog with the optimal sense of security he needs. This kennel is also easy to set up and fold, and it has a strong carrying handle, so it is highly portable. The company even included rubber feet to protect your floors and rounded corner clips to avoid sharp points. You can use the free divider panel to adjust the crate size while your puppy is growing, up to when he reaches his full size as an adult. And don’t worry, if your dog has an accident, the leak-proof plastic pan is very easy to remove and wash. This product comes in seven different sizes to fit various dogs. To find the size that is best for you and your dog, consult the recommended dog weight for every crate size. The Petmate Compass kennel is the easiest to assemble so far, thanks to its Slide N’ Snap feature. It has plenty of ventilation holes, but it still blocks most of the light from outside, which means that your dog will be able to sleep securely without interruptions. This kennel has an oversized doorway, which can be opened both ways for maximum convenience and also two safeguards on the top and bottom of the doors. If your dog is initially hesitant to go inside the crate, you can remove the lid of the Compass and turn it into a dog bed for a while. Also, owners who regularly take their dog on vacations will be glad to know that this crate is airline approved. Just make sure to confirm the airline travel requirements beforehand. This product has quite a range of sizes, accommodating dogs less than ten pounds to larger breeds that weigh in the ninety-pound range. Be sure to pick the one that is appropriate for your dog’s size. The Petmate Sky kennel is perhaps the most durable dog crate made from plastic. It has a hard, plastic shell that gives your dog the feeling of being in a cave. This creates a safe environment that can help him with his anxiety. Other than that, it also has a reinforced steel door to ensure that your anxious dog stays safe during travel, while the larger models offer a vaulted door for extra security. The smaller sizes, however, come with a carrying handle for easier transport. Along with this crate, you get a “Live Animal” identification sticker, along with an absorbent pad and two cups for food and water, which makes it an excellent crate for pet airline travel. This product comes in six different sizes to accommodate small to larger dog breeds so be sure to check out the weight recommendation table. ProSelect Empire acts as a secure metal cage, that is all but impossible for a dog to damage. If the previous choices cannot hold your dog, this escape-proof dog crate will. It has a thick construction made from reinforced steel tubes, as well as robust latches so that it can handle abuse from even the biggest, strongest dogs. Cleaning the Empire Cage is simple, due to a removable steel tray at the bottom. It is also very easy to move around, as you can attach the included wheels to the bottom. Once you have it in place, remove the wheels for maximum stability. This product has two sizes, medium and large. The interior and exterior dimensions of both cages are mentioned on the seller’s page. 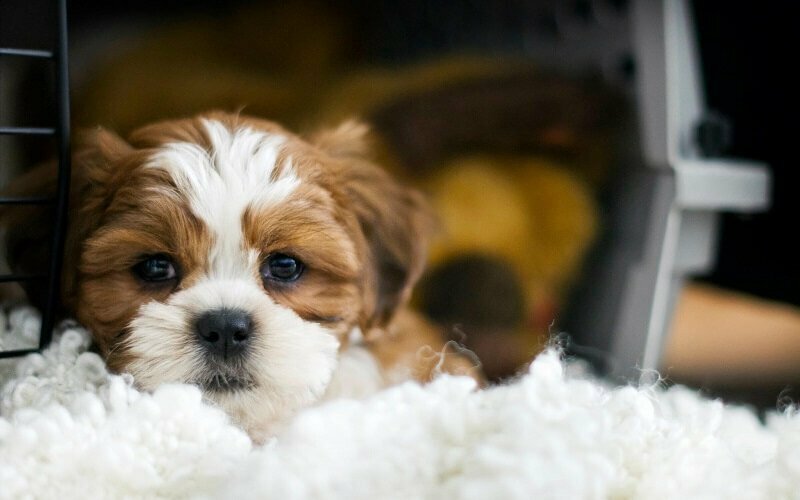 What Are The Benefits of Getting a Dog Crate? A Safe Place for Your Dog: A crate can be your dog’s private space when he is tired or feeling unconfident. But keep the kennel in a quiet area of the house and remove the door unless you are traveling, so it is less intimidating. It is also a secure solution for owners who cannot watch their puppy all the time and worried that he might get into mischief. Doubles as a Cozy Bed: It does not matter if your dog is stressed out or not. All dogs love to sleep and there simply is not a better place to do that than where they feel the safest. To make sure your dog wants to nap in his crate, make it as warm and cozy as possible by padding it with a blanket, or better yet — a dog bed. Keeps Your Dog Under Control: I don’t mean it as a punishment. In fact, you want your dog to love his crate, not fear it. By using praise and rewards, you can train your dog to get into his crate when you need him to. For example, when people are coming over or when you try to get your dog and cat to get along. Effective for Traveling: Portable crates, which your dog is already familiar with, can be used both indoors and on trips. In doing so, they even help your furry companion adjust to new places quickly and stress-free. How to Get an Anxious Dog Inside the Crate? Your dog needs to see his crate as his new safe den — a place where he can feel secure when he is alone, so you should never force him to get inside. There are better ways to deal with a dog who does not like his kennel, such as making it more inviting by leaving a stuffed chew toy inside or a couple of treats and even meals. If you are trying to stop your dog’s separation anxiety, do not let him sleep with you in your bed, as it will only increase his dependence on you. Instead, you want to put a crate where your dog can actually see you, especially at night, so he could rest there knowing you are close. At first, it can be next to your bed. You can use a short leash to help your dog get into his crate every time he jumps on your bed. Be patient, it may take a while. When your dog got used to sleeping in his bed, slowly move it away from you until your it is on the other side of the room. If you want, you can even try to set the crate outside of your bedroom, but do it gradually. The Petmate Sky is a great kennel for anxious dogs of different weights and sizes. This crate has a four-way vault door to keep your dog secure, and you can even take it with you on airline trips if the need arises. Unless you have a really stressed, strong pooch, this is an extremely durable, well-made pet shed and the best dog crate for separation anxiety overall. Click here to check it out on Amazon. Remember – always encourage your dog to spend more time in his crate and who knows? It may just become his most favorite place to relax.